This is a yummy, quick and delicious breakfast, lunch, snack, or dinner recipe (depending on your thoughts on when the appropriate time to eat oatmeal is). I roasted two apples and bananas for about 35 minutes at 375 degrees, then allowed them to cool until I could comfortably handle them. I cooked up some oats in milk and when the fruit was manageable I added the bananas and apples to my Vitamix and pureed (I left it a little bit chunky, but mostly smooth). I combined the pureed fruit with the prepared oats and stirred. You could add a touch of brown sugar if you think it needs sweetening, but roasting your fruit brings out some fantastic natural sweetness and I thought it was delicious without anything else! I put a serving into a Easy Anywhere reusable food pouch for Lindsey to give it a taste test and she definitely approved! I also have to share Lindsey's preferred use for the fantastic Tutti Bimbi baby food tray - not only is it great for freezing baby food, sauces, herbs, etc. but Lindsey thinks it's just right for sorting her Easter eggs! Preheat oven to 375 degrees. Prepare a baking sheet by lining with a baking mat or silpat (or parchment paper). Add unpeeled banana and prepared apples to baking sheet. Drizzle apples with olive oil and lightly sprinkle with cinnamon. Roast in the oven for 35-40 minutes. Peel and discard skin from banana (make sure to get any juices trapped in the peel poured or scraped in with the rest of the banana. Place roasted apples and banana and a small pinch of additional cinnamon (if desired) in your blender (or mash with a potato masher if you want a chunkier blend and your baby prefers a thicker texture - if you are going to mash and not puree, you may want to peel the apples before roasting). Blend. Add water, milk, or breastmilk if needed to thin (I did not need any additional liquid at this stage). Mix the pureed fruit with the cooked oatmeal and stir to combine; thin with additional liquid if needed to reach preferred consistency. Serve immediately in a reusable baby food pouch (if desired) and freeze leftovers in a freezer tray (for best results reconstitute frozen oatmeal cubes with a little additional liquid by warming over low heat in a pan stove top). How easy is it to make nutritious homemade baby food? Save money and use the best ingredients for your baby! Batch prepare some different meals (see our Free Recipe Book for ideas), spoon into the tray and freeze! Stack easily in the freezer or transfer to a ziplock bag to make more. See our Tutti Bimbi Youtube video for more guidance. Why is the Tutti Bimbi Tray the best option? Some trays are made of plastic which shatters when cold, and the lids are poor quality and result in freezer burn on your food. With other trays it can be really difficult to get the food out. The Tutti Bimbi Tray is completely safe. Bacteria resistant, certified free of BPA and Phthalates, and the FDA approved food-grade silicone is safe to use in the freezer, dishwasher, microwave and in the oven up to 460°F. 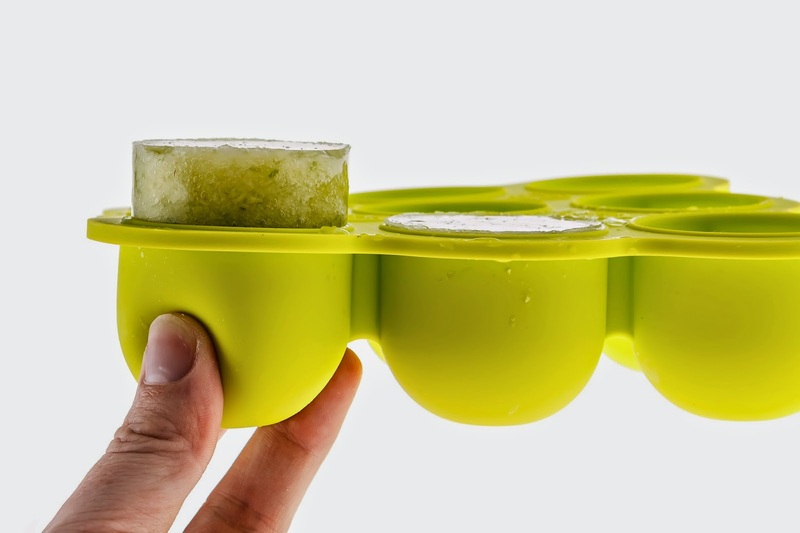 The non-stick flexible silicone enables you to release portions individually, as many as you need, just squeeze the bottom of the pot and it pops out! The lid protects your food whilst it is stored, and can be labeled with a ball-point pen. It also has unlimited other uses such as freezing breastmilk, food leftovers, sauces, broths, stock, fresh herbs, breast milk, large ice cubes. Or use it for making individual jellies, ice pops, cakes in the oven...even a paint palate! Tutti Bimbi believe in only using the highest quality materials that will last, and offer a LIFETIME GUARANTEE. The Easy Anywhere Food Pouch has a reinforced, double zipper so you don't have to worry about accidental leaks. You always know exactly how much food is left in your pouch, thanks to the window on the back of the Easy Anywhere Food Pouch. We're proud of the Easy Anywhere Design. We know babies will love the primary colors. But we haven't made the pouch too childish, so other family members are also comfortable in taking the pouch with them for a refreshing homemade snack on-the-go. No more spilling when you're pouring food into the pouch. The Easy Anywhere Food Pouch has an extra large opening at the top and you don't need any special appliances for filling the pouch. Have healthy organic food ready for the whole week. Just make a large batch of homemade puree, fill the pouches and store them in the freezer. Take a pouch with you in the morning and a couple of hours later you can enjoy a delicious snack. *Full Disclosure: I received complimentary product from Tutti Bimbi and Easy Anywhere for the purpose of review. I received no compensation for this post. All comments are 100% accurate and 100% my own.